The contacts manager has received a thorough refresh in Android 5.0 Lollipop. The app features tabbed interface, which displays all contacts and the favorites. You can sync with multiple accounts including Google and Exchange. A button to add a new contact is constantly present in the bottom right corner - you can choose which account to sync the new addition with. Viewing a contact is a straightforward affair. Missing profile pictures are replaced by solid color. Overall, the new contact manager boasts the usual high functionality. The new interface is pleasant to work with as well. The phone app in Android 5.0, like everything else, has been thoroughly redesigned. Its functionality however, is still a familiar affair. Launching the app brings you to the recent calls section. You can open the dialer at any time - it is readily available via a button at the bottom right corner of the screen. You have three tabs to choose from - speed dial, recent calls, and you phonebook. The in-call screen features solid color and sleek animation. Its layout is easy to read and operate. The in-call quality of the Nexus 6 is superb. We tested the handset on AT&T in the United States and found nothing to frown at. Thanks to its metal frame that doubles as an antenna, there were no hiccups to report. 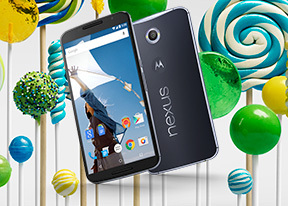 The Motorola Nexus 6 has stereo speakers on its front, which produce good quality audio. It's not very loud though, it's quieter than the the HTC One (M8) and Sony Xperia Z3. Those two also have stereo speakers, but scored an Average mark. You have two options to handle you texts out of the box - Google Hangouts and the stock messenger app. The latter has been thoroughly redesigned. Hangouts has two pages - the first one shows all of your conversations, while the second lists the people you exchanged Hangouts with, plus suggested contacts and other contacts (a.k.a. from your phonebook). The stock messaging section is business as usual despite the new look. All SMS/MMS communication is organized into threads - each thread consists of all messages between you and one of your contacts. The button to begin composing a message is located at the bottom right of the screen. It is bright in color, so you can't miss it. Gmail for Android has been thoroughly refreshed with the released of 5.0 Lollipop. The latest version of the app is now the only email client you will need on your Android device - it can handle any account you throw at it, including non-Google ones. Overall functionality of the app has remained similar to the one it replaces. Swiping from the left reveals the inbox and the various email folders. You can also switch email accounts from the top left corner. Google has found a cool way to tell you about the new Gmail functionality. There's still an icon for the generic email client. However, once pressed, it prompts you to go to Gmail. As expected, the default Android keyboard has been refreshed too. It offers two sleek-looking, brand new skins - Material Dark and Material Light. The duo matches the new look of Android 5.0 Lollipop. Users who don't like change can choose the old Holo theme. Overall, the stock Android keyboard is one of the best in the business and a great option to have out of the box.